The best Snapper seasons typically occur when a year of above average rainfall is proceeded by a year of below average rainfall or when there is a large amount of early season rain (September-November). The reason for these 2 climate patterns producing good catches of Snapper is because early season rain causes large amounts of organisms to be flushed out of all the local creeks and rivers. This Plankton feeds the Pilchard, Garfish and baitfish Schools. These schools in turn feed the Squid, Salmon and Barracouta schools that enter the bay at the same time as the Snapper. 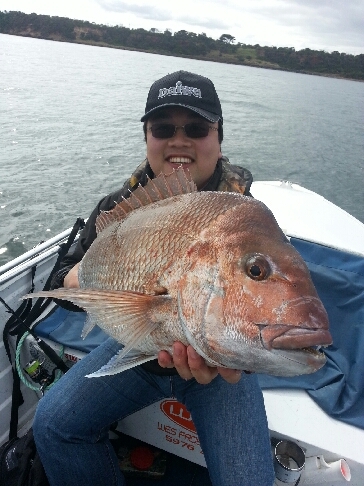 Thus, the more food, the bigger and longer the run of Snapper in Port Phillip Bay. I was recently asked if the season of 2006-07 is one of Port Phillip Bays best in recent years, while I’m writing this article prior to the end of the run of this season, after reviewing the commercial fishing harvests of Snapper and comparing these to Victoria’s actual rain fall, there seams to be some slight correlation between a year of good rainfall followed by a year of little rain fall and larger than usual Snapper catches. If this is a pattern, then yes this year could certainly be one of the best in a long time for the recreational angler. The Snapper have had a lot to contend with. From the season 1978/1979 till 1990/1991 commercial fishermen harvested an average of 162.58 tones of Snapper in Victorian Waters, since then the average commercial harvest has slipped to 59.14 tones. Now there are many factors that contribute to these overall harvest figures but one thing is for certain, the old Snapper was getting an absolute flogging 15 years ago and with a slow growing fish, this had to be effecting the reproductive rates of the fish and the overall health of the fish population, now with better fisheries management in most areas and the Snapper’s habitat in a healthier condition with the stopping of Scallop dredging in Port Phillip Bay(1995), I think that we can all look forward to an improving fishery just as long as we limit our catch not catch our limit ! We must also seriously consider any environmental and/ or habitat changes made by man, actions such as Channel deepening will cause damage, to what extent who knows? One thing is for certain, they will be dumping sediment on grounds that I know the Snapper both feed and breed on! These environmental changes are not in favour of the piscatorial inhabitants or the tens of thousands of recreational users. Snapper are a grazing opportunistic feeder. Snapper inhabit areas where there favoured foods are plentiful. Locations such as Shellfish beds, Soft reefs, Reefs and channel edges are prime haunts for Big Reds. Snapper love an easy feed! After a strong blow or under the cover of darkness Snapper sneak into the inshore reefs and rocky coastal areas for such a feed, this is a fantastic time for land-based anglers to bag a brace. 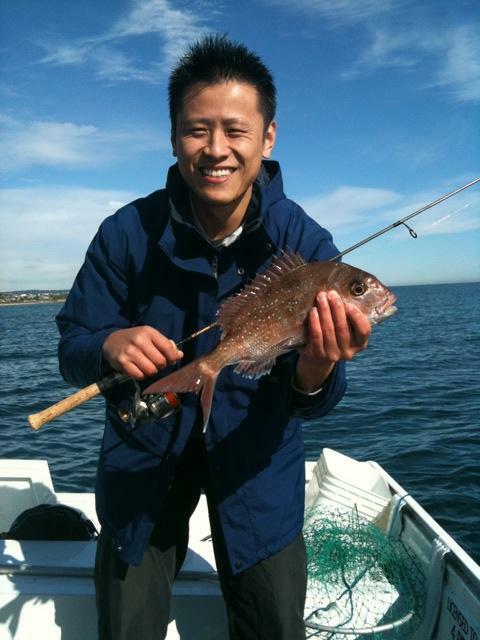 Land based anglers Fishing off the rocks and Piers at St Kilda, Mt Martha and Mornington regularly bag fish in excess of 7kg during these times. When boat anglers are looking for new Snapper grounds, they should look for structure rather than schools of fish on their sounder. Schools of fish can move quite quickly so by the time that you have positioned the boat and set your anchor the fish have simply moved on. When your fishing over mud and sand look for weed and tube worms. These are identified by 1 pixel wide by 2-3 pixel high returns emanating from the seabed. These returns indicate structure, and it’s structure where the fish expect to find food. Look at it this way: If your travelling down a highway and you hungry your more likely to get a feed from a food outlet rather than eat a randomly disposed hamburger on the side of the road! Fish are the same. By fishing the structure your adding your offering to the menu and increasing your chances of a hook-up. To get the optimum out of your sounder your sensitivity should be set to the point where your “Clutter” (the snow like returns through the display) disappears. This is typically between 70% and 90% of your maximum sensitivity setting. All sounding should be done at a speed no greater than 5 knots. Whenever you find a good location you should mark your position with your GPS and record the latitude and longitude in your fishing dairy along with the fishing details of the spot, for example, tide, time, fish, bait, moon and weather. This will not only give you a hard copy record of your “Hotspots” if your GPS looses its memory, but will also provide you with a record to track fish patterns and favoured conditions giving you an insight into the fishes habits and thus giving you the ability to better predict where the fish will be and thus increasing your catch rates. 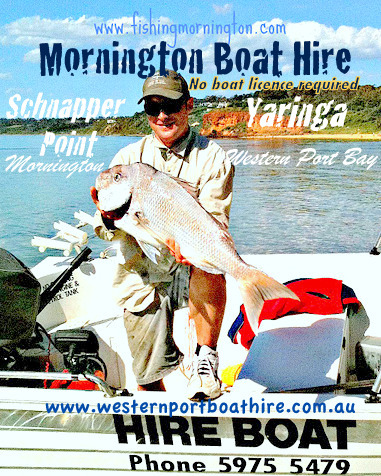 Yaringa Boat Hire: "Self drive fishing boats for charter, Close to Melbourne, Frankston and Dandenong, Western Port Bay the home of Whiting, Gummy Shark, Elephant fish and great Snapper fishing"
As for peak times to bag a brace, fish in the shallower water (below 16 meters and or in the Northern section of the Bay, Mooradalic- Werribee) are best targeted in low light and night conditions as well as rough weather. The deeper waters are best fished with the change of tide, with the absolute peak times for fishing being when a change of tide co-insides with sunrise and sun set. As for moon phases there are many theories, I personally find that the first and third quarters of the moon are best. This being said you will not catch a Snapper in your office or at home. I have had some excellent catches when everything is theoretically wrong, wrong moon, wrong tide and in the middle of the day, you have to be in it to win it, a bait in the water is a chance to catch a fish. The key to Snapper fishing in Port Phillip Bay is being prepared. There are many keen anglers who struggle to find consistency in their results due to their lack of preparation. Each year I have a very good guide to the location of Snapper schools through my fishing diary. Snapper are a fish of habit; they have an uncanny ability of turning up at the same place at the same time each year. Yet they are not totally predictable, this in my opinion adds to their mystique. Always arrive at your chosen location about 1 hour prior to you peak time, this gives you the ability to get you lines set and burley flowing prior to the action starting. Being prepared is the key to success, to make the most of your fishing sorties you must make the most of your time on the water. If you have the time, rig your rods prior to getting on the water, thaw an amount of bait so it’s ready for use as soon as you arrive at your location, have your burley mix made up and have a plan of attack. Early season Snapper tend to travel in large fast moving schools. These schools typically swim in mid water and are generally moving too quick to anchor over and are generally more interested in breeding than feeding. When these schools disperse in their density then this is typically when the best fishing is had. As a general rule Snapper are a bottom feeder, but they are opportunistic by nature so an angler should always try to cover as much of the water column as possible. Snapper baits are a favourite boat ramp and tackle store topic. Snapper will eat just about anything that is fresh. I personally catch my bait prior to heading out on the Snapper Grounds. Fresh squid and Cuttlefish is my bait of choice followed closely by Garfish, Whiting, Australian Salmon and Barracouta. Many anglers use Pilchards religiously, but from my experience the pilchard is just to soft to withstand the hoards of Flathead that can inhabit a Snapper Ground. This being said when the Snapper are around the Flathead will typically disappear. Any fresh flesh bait is worth a try for Snapper, I have caught Snapper on Flathead, Pike, Cod, Scad, Parrot fish, Red mullet and Mullet the list is endless. For success your bait must be well presented. You have to remember that you are fishing when food is plentiful, so your offering has to be up to standard. Fresh caught bait is best, but it is not always possible to obtain, the next best option is bait from the market, and last but not least frozen bait. When selecting Frozen bait look for bait that has clear eyes, not eyes with white spots in them. Also avoid bait that looks freezer burnt and bait that has large amounts of white ice crystals inside the package. When purchasing squid bait make sure that the Squid is clear or white. Squid that has a pink colouration typically has spent allot of time in the sun and is no good. All things said, if you would not consider the bait fit for your consumption don’t expect the fish to consider it fit for theirs! Treat your bait like your going to eat it, keep it cool and out of the sun, this will stop it from spoiling and make it more appealing to the Snapper! Burley is a great tool to bring the fish onto the bite and into the area that you are fishing. For those that are really keen you can tie a burley pot off the end of your anchor chain as well as having a dispenser on the surface at the stern of your boat. I don’t ever have a burley pot that I deploy on a rope and send it down to the bottom. The reason behind this is that all you are doing is giving the fish and the tide something to tangle your lines on. If you want to deploy burley on the bottom, tie a pot on to your anchor chain. The best method I find to deploy the burley is on the surface in a pot tied on to the stern so that the pot is only just in the water. This means that when ever the stern lifts and moves the pot is jerked, releasing a steady flow of burley that will slowly sink to the bottom. By deploying the burley on the surface you create you own eco system. The burley on the surface attracts Garfish and Scad this activity then along with the burley attracts the bigger critters. You should always remember to have traces of your bait in the burley. It’s no good having a great trail of minced fish bait and offering only Squid or vice versa. I liken this to cooking a BBQ and only offering Salad. It’s a key to make sure that your burley is constantly flowing, constantly flowing burley keeps the fish within your fishing zone. Snapper are best targeted with fast tapered (soft tip and powerful but) 4-10kg outfits. My personal preference is for a 6-7 foot rod. This length of rod gives me the ability to keep lines away from the boat and provide a greater separation between the lines. The longer rods also aids in casting lightly weighted baits. Both spinning and overhead outfits are suitable, but reels with a bait running/feeding system are preferred. This gives the angler the ability to set a preset bait feeding drag (typically no tension to 1kg) in theory allowing in greater hook-up rates. In shallower water braided line has little advantages and a good quality 4-10kg fluorocarbon monofilament line will suffice. Reels should be capable of holding about 260 yards of the chosen class of line. For those fishing with reels without a bait feeding feature the angler should fish the reel with the drag set at 1/3 of the lines breaking strength (Normal drag or fighting drag setting). In this situation the fast taper of the rod should hook the fish. Put simply when the rod loads up simply lift/hook into the fish. This method is particularly effective when using soft baits like pilchards, couta and other fish fillets. It’s also very effective when using Silver whiting and Garfish heads. When fishing for Snapper I like to fish as many rods as possible (4 per person limit). To do this successfully you will need to use rod holders. I prefer to use a Snapper Rack style Holder. These come in both a Port and Starboard configuration. The rods tips when placed in the holder should be no more than 30 degrees to the water. Rods when placed in the holders should be regularly attended to, lines should be kept taught and baits checked regularly. The best rig for Snapper in Port Phillip Bay is a 2-hook running sinker rig with 1-2 meters of 30-40lb fluorocarbon leader. I have one hook sliding and one hook fixed, hook size is dictated by bait size, I typically like to use big baits so I more often than not use 6/0 hooks, but in general Snapper anglers will fish with hooks ranging from 2/0 – 8/0. When fishing with a Sliding hook rig I use a Suicide hook as the slider and either a Bait-holder, Suicide or Limerick hook as the fixed hook. When fishing with a Sliding hook rig make sure that your slider is either the same size or smaller than your fixed hook. This gives the bait symmetry aiding in presentation. Always use quality hooks, remember that Snapper have very strong jaws and tough bony mouths so hooks should be very sharp and very strong. For best results I employ a method I can Fanning. Put Simply I cast my baits out in a fan shape. To do this successfully I have a range of sinkers ranging from size 1-3. The sinkers that I prefer to use are Ball, Bean and Barrel. To fan your baits successfully you need to cast the rods with the size 3 sinkers into or against the tide, then cast the rods with the size 2 sinkers at a 45 degree angle to the tide, and the rods with a size 1 sinker with the tide. For example if the boat is positioned with its bow into the current, the rods with the size 3 sinkers are cast at 90 degrees to the boat, the size 2 sinkers at 45 degrees to the boat and the size 1 sinkers straight out the back. This means that my baits are presented throughout the water column and spread over a considerable distance covering a maximum area of seabed as well as eliminating the chance of line tangles. While how to hook a Snapper can spur many a fisherman into a long drawn out debate, I prefer to keep it simple. With Soft baits and Head baits I fish the reel in gear, Big tough baits like squid heads I prefer to fish the reel out of gear in Bait-running mode. In the past I always fished my reels out of gear, even if the reel did not have a bait run feature, these days I fish with a lot of different people and put simply if the reel doesn’t have a bait run feature the reel is fished in gear no-matter what the bait, this just means that there is less room for error, fishing reels out of gear can take years of practice to master and until mastered can result in the loss of many fish. Just keep it simple. When fishing the reel out of gear in bait running mode, as soon as the fish runs reach for the rod and hook the fish as it is running. This generally means that the fish has been running for about 2 seconds prior to you striking. Remember when hooking a fish with the reel in bait running mode you will need to hook and wind at the same time to disengage the Bait run feature and engage the fighting drag. When hooking a Snapper with the reel in gear wait for the rod to load up, then simply lift the rod and fight the fish. Never rush a Snapper to the boat, the harder that you pull on Snapper the harder that it will pull back. Have your drag set so that when the line is pulled from the rod tip the drag releases line at 1/3 of the lines breaking strength, this is best tested with a set of spring scales. The angler should note the tension on the reel so they can replicate this with out using the scales each and every time. The Snapper will typically run twice. The first time on hook-up and the second time as it see the boat, remember to take your time and let the fish run, by doing this you reduce the chances of getting bitten-off, pulling hooks and snapping line, it also means that when the snapper is beside the boat it will give you an easy net shot. Remember always net your fish head first. When purchasing a Snapper net I look for a net with a Long handle, Sturdy construction, Strong Mesh and large head. I much prefer this style of net as it gives the angler greater reach and does far less damage to the fish as a gaff, making for an easier release or a better feed. Many keen Snapper anglers have 2 nets for when things get busy. If your going to kill it, Chill it! The best way to look after your catch is to have a large Eskie or Ice box with an Ice Slurry. An Ice Slurry is simply salt water mixed with Ice. Salt water freezes 2 degrees lower than fresh water so the salt water also help preserve the ice. The Ice Slurry chills the fish just like a cool room does meat. The result is a firmer flesh, better colouration, sweeter taste and a more humane why to kill the fish. I bleed the fish prior to putting it into the Ice Slurry. To bleed the Snapper or any fish for that matter, simply take a sharp and sturdy knife and cut through the top of the gills to the bottom. Bleeding the fish removes the blood from the flesh making the fish sweeter to eat and less fishy in taste. Please, if your going to take home a few fish look after them properly and don’t let them go to waste. If you look after them as described you will not believe how good they actually taste. Good luck and remember limit your catch don’t catch your limit.